Your hardwood floors are an investment worth taking care of. Don’t let maintenance get pushed to the backburner! 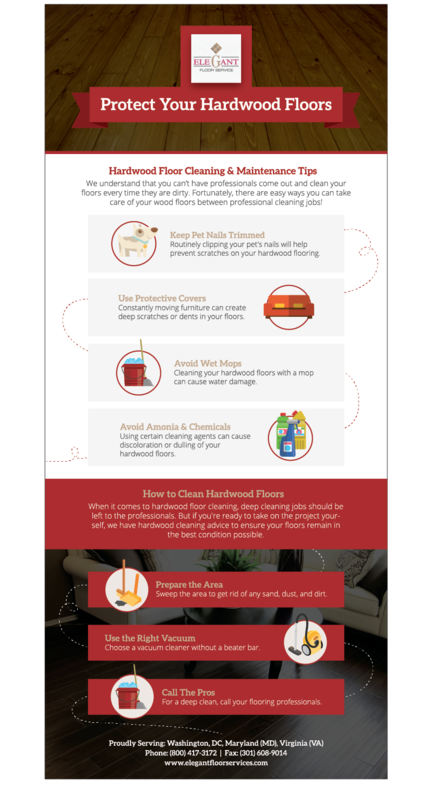 The flooring specialists at Elegant Floor Service have put together a list of hardwood floor cleaning and maintenance tips that should help keep your floors looking new year after year. If you want your wood floors to last a lifetime, you need to take care of them! With your busy schedule, everyday cleaning can become tough – but lucky for you, you can keep your wood floor looking as good as new with regular maintenance from a professional hardwood flooring company. At Elegant Floor Service, we provide hardwood floor maintenance to residential and commercial customers throughout Maryland, Washington, DC and Virginia. If you don’t have time (or just don’t want to deal with) maintaining your wood floors yourself, give us a call or contact us online and we’ll take care of all your wood floor maintenance needs. This entry was posted in Uncategorized on March 20, 2016 by daniel. Should You Refinish Your Hardwood Floors Yourself? Good quality hardwood flooring is engineered to last a lifetime, able to withstand a reasonable amount of neglect or abuse. Though timeless in beauty and design, years of foot traffic from both humans and pets, chemical exposure from cleaning products, dirt, spills, and friction from furniture can take their toll, and floors can begin to look worn, dull and damaged. Unlike carpeting or tile which require replacing, hardwood can typically be refinished, and made to look as good as new, but the question is: Should you refinish your hardwood floors yourself? The method of repair is dependent on the type, and depth of damage to your floors. Inspection. Before the process can begin, it will need to be determined if the floor is thick enough to withstand sanding. Solid hardwood is far more durable, and can accept refinishing as many as twelve times over its lifetime, while laminated planks require the thickness of the veneer to be at least one-eighth of an inch, and may usually only be refinished once. Sanding. A heavy duty drum sander is used to produce a smooth surface, obtained by using a series of progressively finer grit sandpapers. Because of the amount of dust that is produced at this stage, a protective mask and eyewear must be worn, and doorways carefully sealed to prevent travel to other areas of the home. Filling. Any cracks or holes discovered after the sanding process will be filled, and hand sanded to a smooth finish. Staining. Choosing your stain can be fun, but applying it is a long drawn out process, typically requiring several coats and sanding in between each. Finishing. The topcoat is applied, to add a layer of shine and protection, using either a water-based (eco-friendly, low VOC’s), or polyurethane (industry standard, recommended for high-traffic areas) finish. Several coats are applied, allowing floors to dry completely in between each one. Using heavy equipment such as a drum sander, incorrectly, can result in permanent damage to your flooring, and replacement costs far higher than any money you would save refinishing your hardwood floors yourself. Leaving the sander in place for too long for example can cause gauging, and due to the heavy nature of the machine, may be hard to control. Dust and hair removal can be a challenge, and once embedded in dried polyurethane, will become an eyesore. Applying stain evenly is harder than it looks, and if not done correctly can result in uneven coloring or striping. Are you ready to refinish your wood floors in Maryland, Northern Virginia, or Washington, DC? Elegant Floor Service is the company to call! Serving homeowners from Ellicott City to Silver Spring, Bethesda, Vienna, Alexandria, and everything in between, we provide a hardwood floor refinishing service that leaves our clients’ floors looking as beautiful as the day they were installed, regardless of whether they have oak, maple, or another type of wood floor. Our goal is to do the job correctly the first time so you can start enjoying your refinished wood floors as soon as possible. So what are you waiting for? Contact us for hardwood floor refinishing today! This entry was posted in Uncategorized on March 12, 2016 by daniel.